Selling a Home? Watch Out For Agents Looking to "Buy The Listing"
So you’ve decided to sell your home and have a fairly good idea of what you think it is worth. You schedule appointments with three local listing agents who have sold other homes in your neighborhood or you’ve found online. Each Realtor comes prepared with a “Competitive Market Analysis” or CMA and they each recommend a specific sales price. To your surprise, a couple of the Realtors have come up with prices that are quite a bit lower than what you expected and below the Zillow Zestimate (for more on this read How Accurate are Zillow Zestimates? ), and although they back up their recommendations with recent sales data of similar homes, you remain convinced your house is worth more. When you review the third agent’s figures, they are much more in line with your own anticipated value, or maybe even higher. Suddenly, you are a happy and excited home seller, already counting the money. 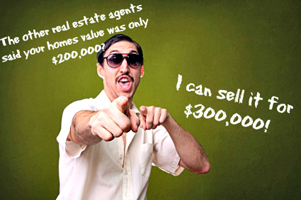 Be cautious of the agent who recommends the highest sales price, it’s often their own interest they have in mind! If you’re like many people, you select Realtor number three to list your home. This is an agent who seems willing to listen to your input and work with you. This is an agent that cares about putting the most money in your pocket. This is an agent that is willing to start out at your price and if you need to drop the price later, you can do that easily, right? The truth is that you may have just met an agent engaging in a questionable sales practice called “buying a listing.” S/he “bought” the listing by suggesting you might be able to get a higher sales price than the other agents recommended. Most likely, s/he is quite doubtful that your home will actually sell at that price and rather the intention from the beginning is to slowly but surely talk you into lowering the price. Why Do Some Agents “Buy” Listings This Way? There are basically two reasons. A well-meaning and hard working agent can feel pressure from a homeowner who has an inflated perception of his home’s value. On the other hand, there are some agents who engage in this sales practice routinely. How Does it Affect You and the Eventual Sale’s Price of Your Home? There is an inverse correlation between the time it takes to sell a home and the price at which it sells and thus it is best that the home be priced appropriately from the start. Furthermore, homes typically receive the highest levels of traffic in the first 30 days they are listed and thus if the home is initially over priced you are missing out on the best opportunity to sell your home! The simple fact is buyers engage in comparison shopping and they will not pay more for a property than they could pay for another that is similar. If your home is not priced in accordance with similar homes, you will not realize as many showings which will result in a delayed sale and ultimately a lower sales price. The agent who bought your listing has accomplished what he or she set out to, they secured your listing and will eventually earn their commission but at your expense!